I attended another funeral today in Sterling. Since the lady who passed was the wife of a fellow pastor in my Association, I went to support him. Sterling is only about an hour from my house, so it was nothing close to my 970 mile trip in my previous post. However, whenever I go on some sort of road trip, I have been trying to take my camera because I always see something I want to remember or something unique. This road trip did not disappoint. When I got close to home, I saw some very unique equipment running along the railroad route which runs through Wiggins. I am not exactly sure what they are but I can guess on a couple. If you know what these are, please post so we all can be educated. First on the track, I saw this contraption. It was so long, I had to take it with a panoramic setting (with all the following, click image for larger picture). Ok. So this fascinates me. My guess, in the context of the following pictures of vehicles, this digs up the rocks found between the tracks so it will expose the ties. It looks like these rocks are maybe shuttled up a conveyer and then through another conveyer to a container? I am not sure. Maybe the rocks are getting cleaned and the residue is going to the container? 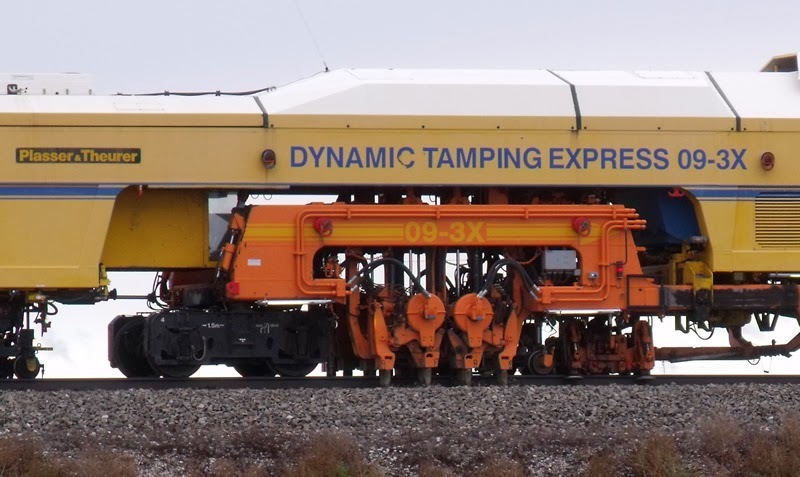 I have absolutely no clue but I am putting my money on that this may be a machine to remove the rocks from the between the rails. This is due to the next piece of equipment. it says it right on the side of the machine. It is my guess that this interesting looking engine straightens out the ties and make sure they are securely in place. Perhaps it just beats the nails, or whatever holds the ties in place, so they are secure. I liked watching this process. Here is a video. This looks like some sort of sci-fi, robot, construction device or something. I love the way it moves. Finally, following these two distinctive pieces of machinery was a final mystery. To me, this mechanism looks like it takes the rocks and moves them back on to the ties. I have a video of this process as well. I have no idea what these are (Brian, if by any chance you read my blog, let me know what these are!) and I guess that is what interested me in these. I am not a train enthusiast, per se, but trains are an integral part of our country's economy. It seems like these strange looking pieces of technology help those trains keep running. Or not...I have no idea.